Professional racquet service is the hallmark of our business. Pete Oman, the store owner, is a USRSA Master Racquet Technician, the highest certification a professional stringer can achieve. Professional racquet service is the hallmark of our business. 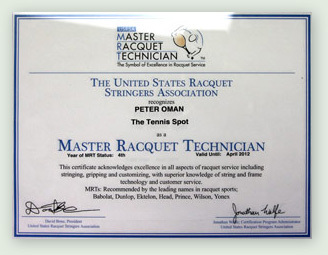 Pete Oman, the store owner, is a USRSA Master Racquet Technician, the highest certification a professional stringer can achieve. He has over 15 years' experience stringing all types of racquets, for beginners and pros alike! Tennis Spot customers enjoy the benefit of our excellence in all aspects of racquet service, including stringing, gripping, and customizing. Whether you need more power, control, durability, or relief from tennis elbow, our knowledge of string and frame technology will help you make the best string selection. 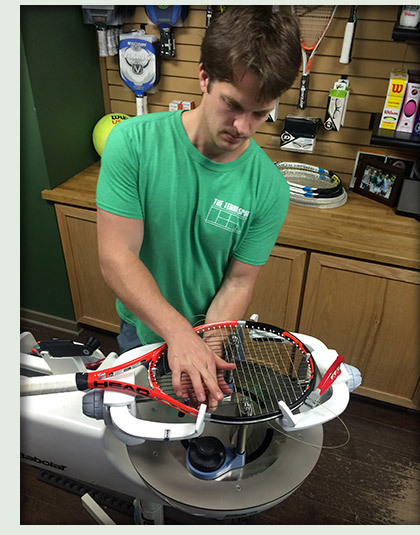 We offer quick 24-hour turnaround time on racquet restringing. With advanced notice, we can usually get a racquet back to you within a few hours, or string it for you on the spot if we’re not too busy.